The perfect child's shirt to celebrate Mother's Day. 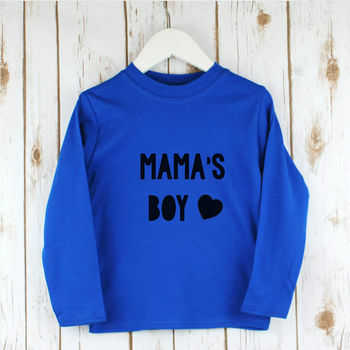 This cotton top says 'Mama's Boy' and is ideal for telling Mummy how much you love her! This sweet child's t shirt is professionally printed by Betty Bramble in our studio in Surrey, England. The pure cotton t shirt features a smart crew neck and long sleeves, with a choice of seven colours: bright red, royal blue, navy blue, white, grey marl, candy pink and bright pink. It is an ideal treat for Mother's Day, Mummy's birthday or just to tell your her how much you love her! This design is also available as an adorable bodysuit from newborn to age 18 months. Pure supersoft cotton, made in Britain. Our t-shirts are a unisex, generous fit, made to last. If you prefer a slim fit or are undecided on the size we recommend you buy a size down. Please do not hesitate to contact us with any queries. This product is dispatched to you by Betty Bramble.